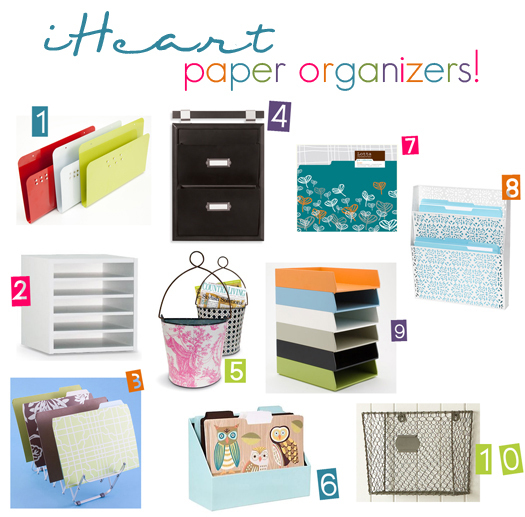 IHeart Organizing: You Asked: Tame the Paper Monster! 14 You Asked: Tame the Paper Monster! Papers always seem to be a nightmare. It's one of the main items I receive questions regarding, and I am the first to agree that paper is a constant battle to keep maintained and under any type of control. You add kiddos into the mix, and you have some major paper pile monsters to tame! And such a great question it is. As you can imagine, most individuals manage all of their incoming mail and paperwork either in their entry, kitchen/dining or living rooms. That’s where we enter the home. That’s where the kids unload their backpacks. That’s where the home’s hub typically is. So even if you have an effective and practical system, it can also quickly become potential clutter and eye sores, and it’s not always easy to marry the two. 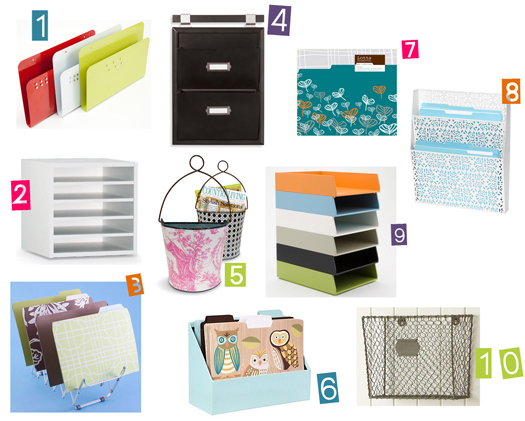 But can you imagine the fun I had online window shopping for paper organizers? Wow. So much greatness out there! I am gaga for the clean look of these magazine files, and because they are also magnetic, you can attach quick notes to each member of the family to the fronts! This cube option allows each member of the family to have their own “slot”. The cube itself can either be left out or tucked behind a cabinet door! How smart is this desktop organizer? Keep paperwork/files order and visible with the six-slot organizer which has the option of being desktop or wall mounted! The Pottery Barn Daily System always seems to be a win but it also comes with a hefty price tag. 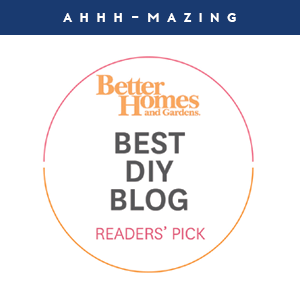 Bed Bath & Beyond offers a similar look for a fraction of the price! You all know what a fan I am of the pretty colors and endless design options offered by The Macbeth Collection, and these wall buckets are no exception! They would look amazing for years in any space! This desktop organizer is super space saving! It’s a great solution to keep at your counter since it’s just as cute as it is functional! 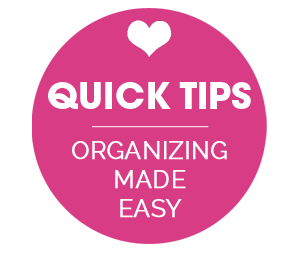 Looking to organize papers on a mega budget? Take a manila folder and use either hot glue or packing tape to seal the outer edges. 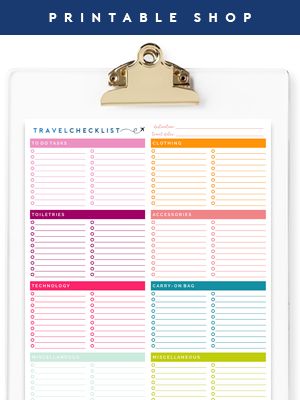 Add a label to the front and a strong magnet to the back and slap it on the side of the fridge. Instant paper pouch! This wall file holder would dress up the walls in any space! I can’t get enough of the lovely white cutout pattern; it’s an all time personal fav! What’s not to love about these stackable letter trays? With all the color options, it’s easy to incorporate them into any space, or assign a different color to each member of the family so they can quickly locate their docs! I adore the cottage feel that these wire wall pockets offer. Great for magazines, file folders or papers, these wall pockets will be sure to give your space organization for a lifetime! Who’s inspired? Are your wheels spinning? And my biggest reminder is to never forget to use the items you find online, as inspiration for a little DIY! It’s always a great idea to check out your home and local thrift stores and give new life to old pieces using some of the ideas from above! When it comes to keeping a good system, the biggest rule of thumb is to open the mail, recycle the junk and assign each piece to the correlating “in-box” right away. Slot 15 minutes once a week to go through the inbox and handle all the paperwork, which will give you a fresh slate each week! So who else has a favorite paper taming tip? Anyone DIY any great paper sorters lately, or find one that they just HEART to pieces, that I didn’t mention above? Pssst. I wasn't paid or perked by any of the links mentioned above. 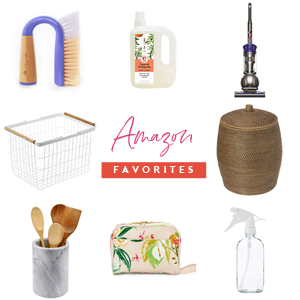 Just thought I would do a little paper sorting window shopping and share the items IHeart most! Want to see more of how I organize our paper piles? You can check out the "Project Paper" party here. You've totally made me fall head over heels for that white cutout pattern ever since you posted one in your makeover! I saw a TON of them at Homegoods and Marshalls recently for 14-19 bucks a pop (all different sizes and styles!) and totally thought of you! I am a "pile-er" and successfully use number two. You can get it at A.C. more for ~$18 with a 40% or 50% off coupon. I use them for my to do "lists". They are labeled: Computer, Car/Errands, Phone/mail, Home, Projects/misc. I keep my laptop in the computer file and my phone is stored in the phone/mail file as well as a small bin with stamps, envelopes, address labels and checkbook. My keys go in the car/errands (this is where shop list and other things like this go). The computer file is where I stick cut outs for websites I want to visit, bills to pay online, etc. The project/misc file acts as a tickler for things I may want to do later on. I bought a home a year ago so I put info about new windows, home projects, ect in here. I also keep a large bin on top of it for anything that has to go to the car/errands that doesn't fit in the slot (library books) and outgoing mail so I can grab it when I leave. It works perfectly for me. After everything I tried this is the best system and I have stuck with it for the longest time. There are other boxes like this sold at A.C. Moore that have drawers, etc. I may eventually add on but this is simple, uncomplicated, and small. I also keep a calender posted above it and my planner beside it so I can quickly look up phone numbers, etc. I check each bin daily and try to do 2-3 things. I always think I can do more then I have time for so if I find I may not want/need to do during review it goes into projects/misc (unless I'm sure then I toss it). I review the project/misc bin 1x week and usually toss 1/4-1/2 of it since it also acts as my "purchases to consider" slot. I will try to take a pic later if any other chronic pile-ers are interested in seeing my set up. With school starting this week, this is aptly timed. Thanks! Well I don't know if this a paper taming trick...more of a way to recycle papers and get more use out of them. I keep all my kids' school papers that are plain white on the back and use to them to print on. I print lots of coupons and don't need "clean" paper for those. Those school papers are perfect! I use a system simila to #6 above. Mine isn't as pretty but it works. 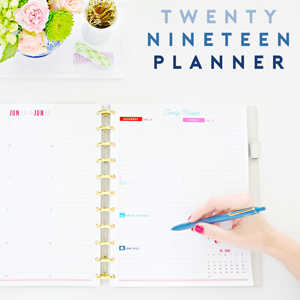 I keep a silver three tiered file holder on our kitchen counter with three pretty file folders. One for coupons, one for tax information and one to be filed. All my bills are electronic now, so I don't even have to worry about losing or filing those! I have a 4-file organizer that has magnets on the back and can hang on the fridge. OMG, my apartment totally needs one of those. My roommate and I have just been throwing our mail on our dining room table, which gets thrown onto our bookcase when we're eating dinner then it just stays there and piles up...it's kind of embarassing. Just went to Office Max today. They have great stuff for taming paper... this basket could easily be mounted to the wall with screws - and you could use the clear paper files to keep things in them! Funny, I just did a post on organizational tips that included a mail center project. I am really attracted to the simplicity of number 1. The bright colors are nice too! I'm a paper hoarder - I have a mountain of papers to organize and need boxes! But how I love the wonderful colours! The magnetic magazine file is fabulous! I am a piler too and struggle so much with keeping organized once I get things in the right place...they just stack up (and up and up)! I love this site! You are an inspired girl and I will visit often now that the boys are in school -- yes!! !